Columbus has a knack for presenting an assortment of holiday music parties, a testament to the vast local talent that exists in this city. 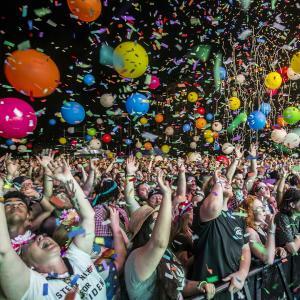 New Year&apos;s Eve happens to be one of those holidays where everyone wants to celebrate, and if you’re not looking to do it big and head out of town to begin 2019, there’s an eclectic amount of shows to attend in our city. Below you can find six local shows ranging in style from funk to R&B to DJ dance music, that vary in admission prices from venues spanning from your favorite local music venues to a hotel. There’s a little bit of something for everyone to check out. All shows take place on Dec. 31 heading into 2019. MojoFlo have cemented a city-wide reputation for bringing the party to wherever they might be playing, and New Year&apos;s Eve at Woodlands shouldn’t be any different. Come early to peep a happy hour by one of Columbus’ finest jazz musicians, Tony Monaco. Afterward it’ll be time to start counting down in the funkiest way possible with a set from TATTAT, leading into MojoFlo ringing in the New Year. Stay even later for some extra funk’n fun with TATTAT after the ball drops. Trying to escape the hometown winter blues but don’t have the cash to travel cross state? Indiana hippy metal activists Glostik Willy may have a solution for you. In a partnership with local music production company Weird Music, Glostik Willy presents the first-ever Hotel Willy NYE. The event will feature support from local heavyweights Zoo Trippin’, Conscious Pilot and Electric Orange Peel, so love for Columbus music will be in the air all night long. With one-night sleeping accommodations costing around $100, make sure to reserve your room today before prices increase. If you’re trying to put on airs this New Year&apos;s, look no further than Brothers Drake. There, you will have your choice at sitting down or getting your groove on to the music; there’s room for both. The first half of the night will kick off with live jazz from frequent Brothers performer Stan Smith and a celebration of London’s New Year at 7 p.m. A dinner buffet from Ajumama and two drink tickets is included with a London Time pass. At 9 p.m. the New York Time celebration will kick off with local crooners Sarob and Parker Louis and DJ Bohno as entertainment before and after the ball drop. There is also an all-night ticket option. Copious is going for broke this New Year&apos;s, and The Deal Breakers will be bringing their immersive talents and brand of global hip-hop and R&B to the spacious Loft for an intriguing celebration. Admission will include a whiskey tour and wine tasting, as well as an art show to top off the evening. While The Deal Breakers will be bringing the energy throughout the night, guests will also be able to enjoy appetizers, cocktails and some other fun surprises. Looking to save some money heading into 2019? Skully’s presents an affordable New Year&apos;s Eve party at their space, one of the city&apos;s favorite local dance venues. With music being spun by DJs Chuckstar and Skulldog—two veterans who know a thing or two about the Columbus dance scene—it’s sure to be a memorable time heading into 2019 without breaking the bank. Toast with champagne at midnight is included. If you’re looking to really save heading into 2019, look no further than Spacebar’s NYE show. The bands are top secret for now, but knowing Spacebar’s reputation, you know they’re going to pack the house with some flooring entertainment. If it’s not in-your-face, then it probably doesn’t belong at Spacebar. This venue has been serving as a testament for years that live rock ‘n’ roll is still alive. On top of free entry is free champagne. Here’s to 2019!